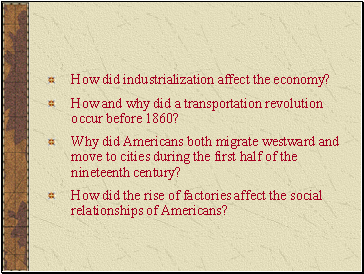 How did industrialization affect the economy? How and why did a transportation revolution occur before 1860? Why did Americans both migrate westward and move to cities during the first half of the nineteenth century? How did the rise of factories affect the social relationships of Americans? In America, a French visitor remarked in 1839, “all is circulation, motion, and boiling agitation. 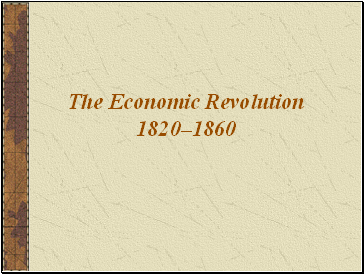 Enterprise follows enterprise [and] riches and poverty follow.” Indeed, society was changing in basic ways. 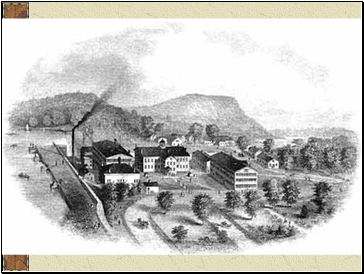 In 1820, the United States was predominately an agricultural nation; by 1877, it boasted one of the world’s most powerful manufacturing economies. 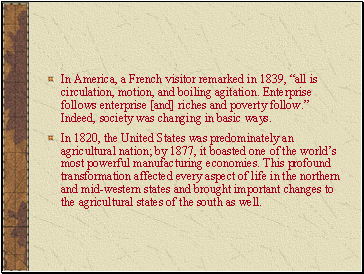 This profound transformation affected every aspect of life in the northern and mid-western states and brought important changes to the agricultural states of the south as well. People often have difficulty understanding how technological innovation developed. 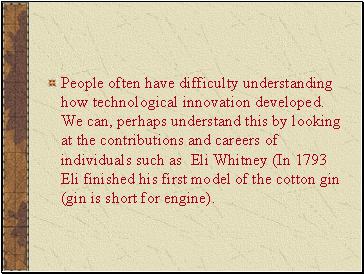 We can, perhaps understand this by looking at the contributions and careers of individuals such as Eli Whitney (In 1793 Eli finished his first model of the cotton gin (gin is short for engine). 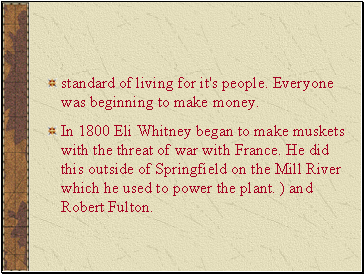 The entire country profited greatly from Eli Whitney's idea and ability. 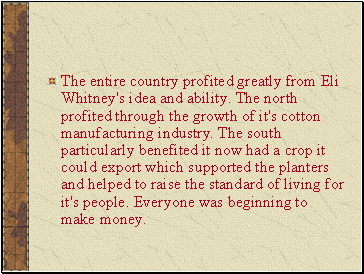 The north profited through the growth of it's cotton manufacturing industry. The south particularly benefited it now had a crop it could export which supported the planters and helped to raise the standard of living for it's people. Everyone was beginning to make money. standard of living for it's people. Everyone was beginning to make money. 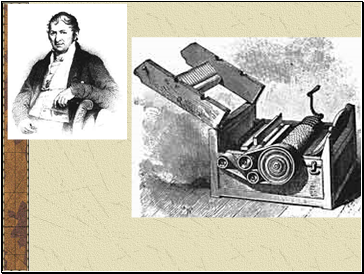 In 1800 Eli Whitney began to make muskets with the threat of war with France. He did this outside of Springfield on the Mill River which he used to power the plant. ) and Robert Fulton. In 1802 he contracted to build a steamboat for Robert R. Livingston, who held a monopoly on steamboat navigation on the Hudson. In 1807 the Clermont, equipped with an English engine, was launched. A number of men had built steamboats before Fulton, including John Fitch and William Symington. 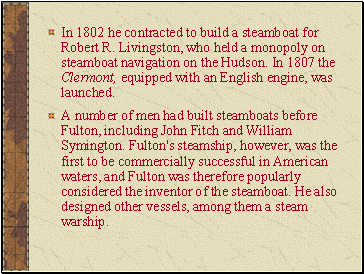 Fulton's steamship, however, was the first to be commercially successful in American waters, and Fulton was therefore popularly considered the inventor of the steamboat. He also designed other vessels, among them a steam warship.